AGI-5198 is the first highly potent and selective inhibitor of IDH1 R132H/R132C mutants with IC50 of 0.07 μM/0.16 μM. J BIOL CHEM, 2018, doi:10.1074/jbc.RA117.001385. AGI-5198 purchased from Selleck. Compound is prepared as 10 mM stock in DMSO and diluted to 50X final concentration in DMSO, for a 50 μL reaction mixture. IDH enzyme activity converting alpha-ketogluta rate to 2-hydroxyglutarate is measured using a NADPH depletion assay. In the assay the remaining cofactor is measured at the end of the reaction with the addition of a catalytic excess of diaphorase and resazurin, to generate a fluorescent signal in proportion to the amount of NADPH remaining. IDH enzyme activity in the direction of isocitrate to alpha-ketoglutarate conversion is measured by direct coupling of the NADPH production to conversion of resazurin to resorufin by diaphorase. In both cases, resorufin is measured fluorometrically at Ex544 Em 590. Rohle D, et al. Science, 2013, 340(6132), 626-630. Vidofludimus is an orally active and potent dihydroorotate dehydrogenase (DHODH) inhibitor with IC50 of 134 nM for human DHODH. Phase 2. 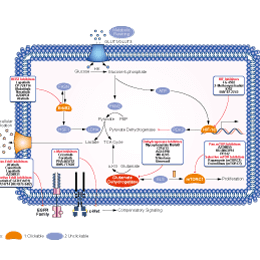 CPI-613, a lipoate analog, inhibits mitochondrial enzymes pyruvate dehydrogenase (PDH) and α-ketoglutarate dehydrogenase in NCI-H460 cell line, disrupts tumor cell mitochondrial metabolism. Phase 2. Gossypol Acetate is a polyphenolic aldehyde that permeates cells and acts as an inhibitor for several dehydrogenase enzymes such as lactate dehydrogenase, NAD-linked enzymes. Mycophenolate Mofetil is a non-competitive, selective and reversible inhibitor of inosine monophosphate dehydrogenase I/II with IC50 of 39 nM and 27 nM, respectively. 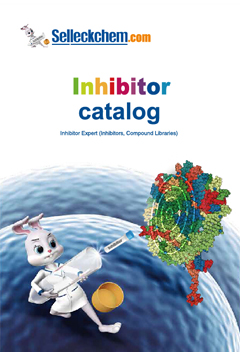 AGI-6780 is a potent and selective inhibitor of IDH2 R140Q mutant with IC50 of 23 nM. Leflunomide is a pyrimidine synthesis inhibitor belonging to the DMARD, used as an immunosuppressant agent.